Organization and ease of use were very important to this client, and Zee Designs received praise for successfully completing both tasks. 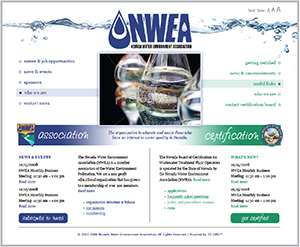 The NWEA website was designed with water in mind. Great care was taken to make the extensive content of the association and certification branches of this organization work cohesively together. Throughout the site, the site style coloring matched the site map visitors were viewing. Along with using many modules inside its website, Zee Designs also developed a custom solution for NWEA. 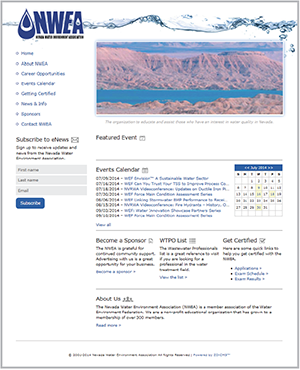 The WTPO List Module gives the NBC-WTPO staff the ability to manage and organize a large volume of records easily in their Wastewater Treatment Plant Operators, Analysts, and Inspectors List. 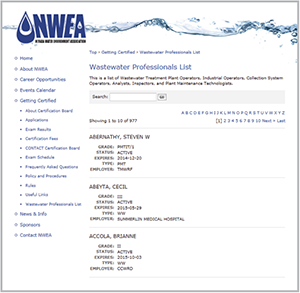 Website visitors are able to view the most recent list at any time, as well as download a PDF file of the data. With careful planning from all involved parties, each business aspect is distinguishable and their large volumes of information are well organized. See for yourself . . . Visit the NWEA Website today!